A Media Lectern Works Great For Presenters to Use for a Speech Where AV Equipment May Be Used! 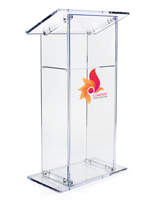 These Multi-Media Podiums Are Great Lecterns for Churches or Schools! 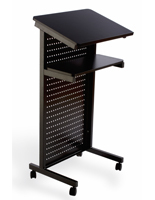 This media lectern has a distinctive perforated pattern design that allows cool air to reach presentation equipment. The black body panels and silver frame induce a modern industrial appearance for this presentation pulpit that will complement modern and traditional classrooms or conference centers. As a piece of conference room furniture, a media lectern with an adjustable reading surface is ideal. In the angled position the reading surface holds notes or meeting agendas at the ready while a laptop computer or projector is right at home when laid flat. One adjustable internal shelf and two fixed surfaces provide ample space for presentation equipment, handouts, lab supplies or anything else necessary for the conference or lecture. Cable ports throughout the media lectern ensure that power and data can be easily routed to where it is needed. 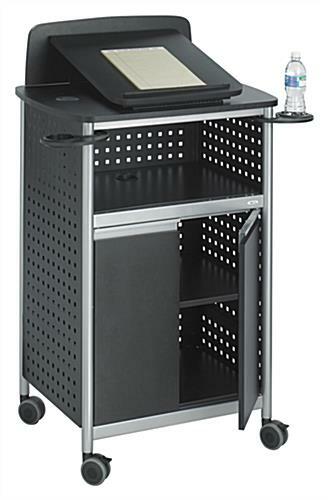 This multimedia pulpit, a media lectern has four casters that provide easy movement. To keep this podium from moving during a presentation, two of the casters lock. This conference room furniture, a media lectern is constructed of steel components with a black and silver powder coat finish. 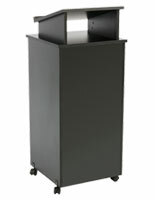 The powder coated finish produces a durable finish for this podium that will last through years of use. A matching black laminate finish is used on the top assembly, two middle shelves and the doors. The resulting surfaces are durable and rigid capable of holding AV components and computer equipment. The media lectern, such as presentation podium or audio visual furniture has two swivel-out cup holders. Teachers and presenters will appreciate that water can be kept close at hand while in front of the audience. The swivel-out design means the drink holders can be tucked away when they are not needed on this presentation podium. Note: The cup holders can be excluded during assembly or removed from this media lectern for organizations that do not want liquids close to expensive presentation equipment. To save on shipping costs, assembly is required for this media lectern. 28.8" x 49.8" x 22.0"